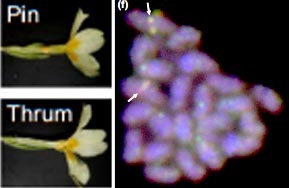 In situ location on chromosomes of Primula S-locus-related genes. Li et al. New Phyt 2015. Heteromorphic flower development in Primula is controlled by the S locus. The S locus genes, which control anther position, pistil length and pollen size in pin and thrum flowers, have not yet been characterized. We have integrated S-linked genes, marker sequences and mutant phenotypes to create a map of the P. vulgaris S locus region that will facilitate the identification of key S locus genes. We have generated, sequenced and annotated BAC sequences spanning the S locus, and identified its chromosomal location. We have employed a combination of classical genetics and three-point crosses with molecular genetic analysis of recombinants to generate the map. We have characterized this region by Illumina sequencing and bioinformatic analysis, together with chromosomein situ hybridization. We present an integrated genetic and physical map across the P. vulgaris S locus flanked by phenotypic and DNA sequence markers. BAC contigs encompass a 1.5-Mb genomic region with 1 Mb of sequence containing 82 S-linked genes anchored to overlapping BACs. The S locus is located close to the centromere of the largest metacentric chromosome pair. These data will facilitate the identification of the genes that orchestrate heterostyly in Primula and enable evolutionary analyses of the S locus. This entry was posted in Publications, Species and tagged BACs, breeding, breeding systems, chromosomes, compatibility, darwin, genes, genetics, in situ hybridization, incompatibility, linkage, mapping, primrose, Primula, recombination. Bookmark the permalink.